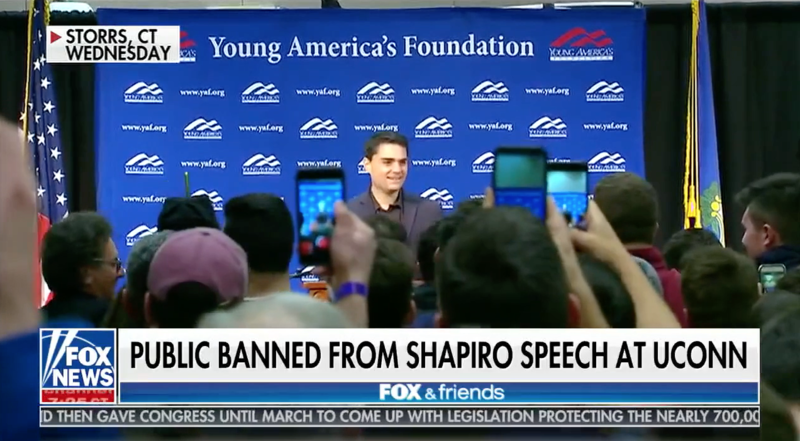 These are the words of Fox News’s Todd Piro, reporting on last week’s Young America’s Foundation lecture with Ben Shapiro at the University of Connecticut—part of YAF’s Fred Allen Lecture Series. “Why is an event like this so important for First Amendment rights?” Piro asked Shapiro. “It’s always important for people who are not necessarily of the prevailing political view to be able to come on campus and talk to students who are not used to hearing these viewpoints, particularly if they find them discomforting and uncomfortable,” answered Shapiro. The event was an incredible success—attracting an audience of more than 500 students—despite the Left’s best efforts to derail the program. Prior to the lecture, UConn administrators banned the public from attending and also sent an email to pre-condition students to react adversely to Shapiro’s appearance. In the University of Connecticut’s “Chief Diversity Officer” email, counseling was offered to those who were unable to control themselves in light of Shapiro’s appearance. In addition, campus leftists hosted a counter event at the same time as the YAF lecture. But students saw through the lame attempts of the administration and liberal students and were rewarded for their perseverance with a crash-course in conservative principles. Those are the “controversial” words from Ben Shapiro that caused the University of Connecticut to block the public from attending. Once again Young America’s Foundation helped bold conservatives bring freedom’s principles to their campus, proved wrong the Left’s fears about conservatives, and won the day by providing a forum for the free and open exchange of ideas that should be the trademark of higher education.